Space debris could be conquered by a laser mounted to the International Space Station (ISS), which would remove it from Earth's orbit entirely, according to Japanese scientists. While it may sound like a script from a Sci-Fi movie, researchers from Tokyo's Riken research institute insist the strategy could easily be introduced in real-life. The proposed method is outlined in theirpaper, published in Acta Astronautica. According to the researchers, pieces of debris could be found up to 62 miles (100 kilometers) away, using the Extreme Universe Space Observatory's (EUSO) super-wide-field telescope – which is already mounted to Japan's Kibo Experiment Module on the ISS. 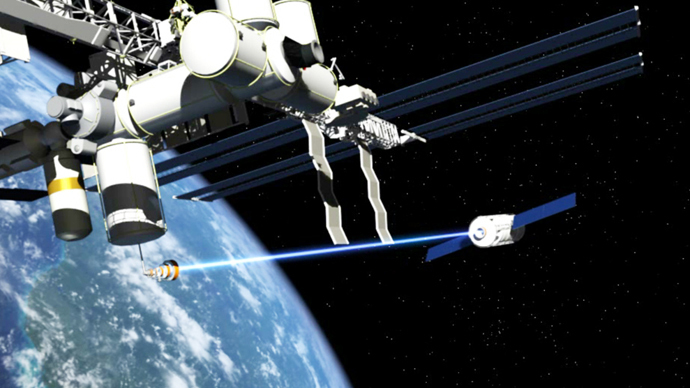 Pulses from the laser (which is not yet mounted on the ISS) would then reduce the velocity of space junk, pushing it into Earth's atmosphere where it would burn up. The laser would create the pulses by using bundles of optical fibers capable of both high power and high frequency. By using the capabilities of both instruments, space debris could be reduced to just 0.4 inches (one centimeter). The masterminds of the strategy intend to launch a small experiment on the ISS, using an eight-inch (20 cm) version of the EUSO telescope and a laser with 100 fibers. “If that goes well, we plan to install a full-scale version on the ISS, incorporating a three-meter [10ft] telescope and a laser with 10,000 fibers, giving it the ability to deorbit debris with a range of approximately 100 kilometers (62 miles),” said lead researcher Dr. Toshikazu Ebisuzaki. But Ebisuzaki's ambitions don't stop there. “Looking further to the future, we could create a free-flyer mission and put it into a polar orbit at an altitude near 800 kilometers, where the greatest concentration of debris is found,” he said. The lead researcher went on to express full confidence in the concept, stating his team's proposal is more manageable than the ground-based, conventional approach. He added that it is accurate, cheap, and fast – and that the system could eliminate most centimeter-sized debris within the first five years of operation. Although Ebisuzaki and the other researchers are undeniably excited about the EUSO telescope's potential to fight space junk, the device was originally developed for an entirely different reason – to detect ultraviolet light from air showers produced by cosmic rays. Meanwhile, the fiber-powered laser was developed to power particle accelerators. Space junk, which consists of artificial objects orbiting the Earth, results from human space activities. It is accumulating at a constant rate. In fact, the amount of space debris nearly doubled from 2000 to 2014. NASA estimates the total mass of space junk to be around 3,000 tons.